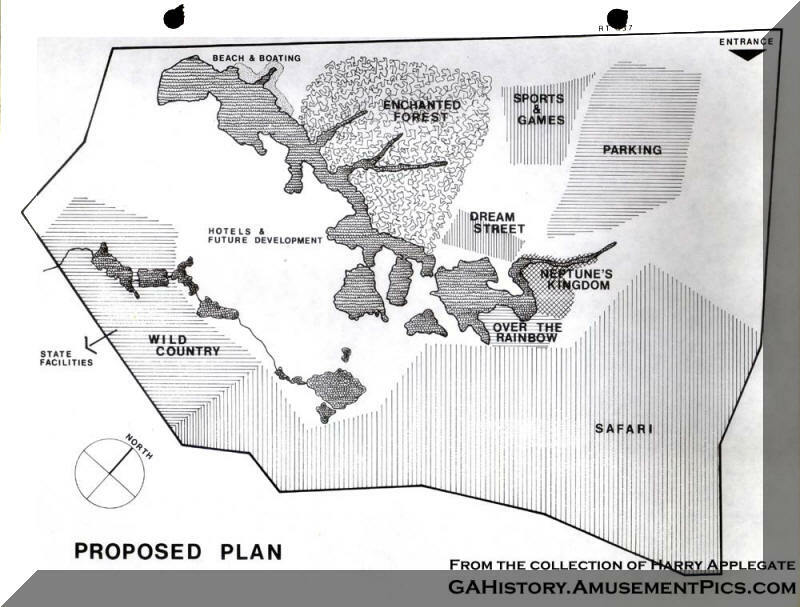 Click here to view Warner LeRoy's original proposal for Great Adventure back in the early 1970's. 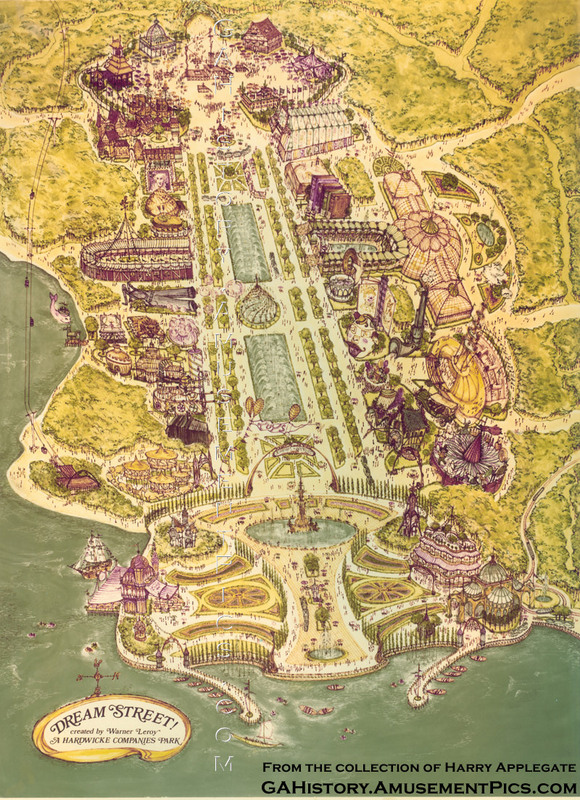 If Warner LeRoy remained at Great Adventure and continued to headup its design, anyone care to speculate what Great Adventure would look like today? Probably a lot more colorful, and the food selections would be amazing. All that dark red space on the left is still zoned as 'Recreation Commerical' probably since the early 70s ala Warner LeRoy's plan. That's a great find. It's interesting because ALL of the park's property is zoned the same way including the strip they own all the way over to the interstate where they planned to build the entrance to bypass 537. I wonder where in Jackson MythFaire was proposed? 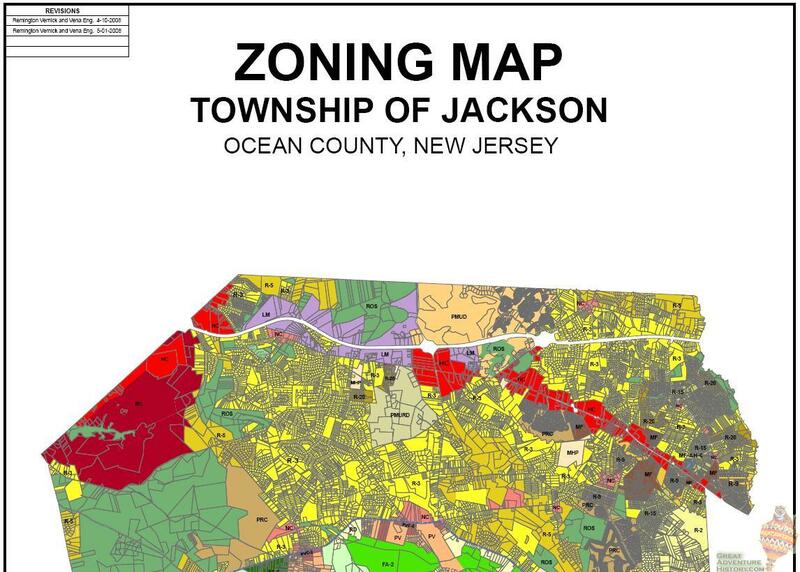 I remember they mentioned having to re-zone for it so it wouldn't show up in the recreation color, but it was supposed to be a fairly large tract of land. Now Updated and Expanded for Great Adventure's 35th Anniversary! 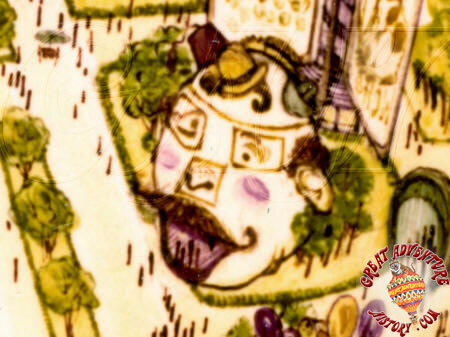 The oversized detailed structures that were originally planned for the park would have been impressive to see. Some of these, especially those planned for Dream Street, were quite dramatic. The closest this came to reality was the Best of the West with the larger than life Conestoga Wagon, Super TeePee, and Fort. It would have been interesting to see if the test of time would have taken its toll on the dozens of original structures just like it did on the Super TeePee? Interests:Coaster, parks and their history, Computers. It woudl have been interesting to see what The buildings and design would have been like if built. But we would also have to wonder if the park would have survived. Many parks that were trying to be like disney in those days did not service. Freedome land in New York and Fantasy Island in MA both come to mind. i think the oversized bldgs would be to much for GA, i think they picked the best most structerly sound designs and went with what we got, If there were otheres in the park it would just be too much. 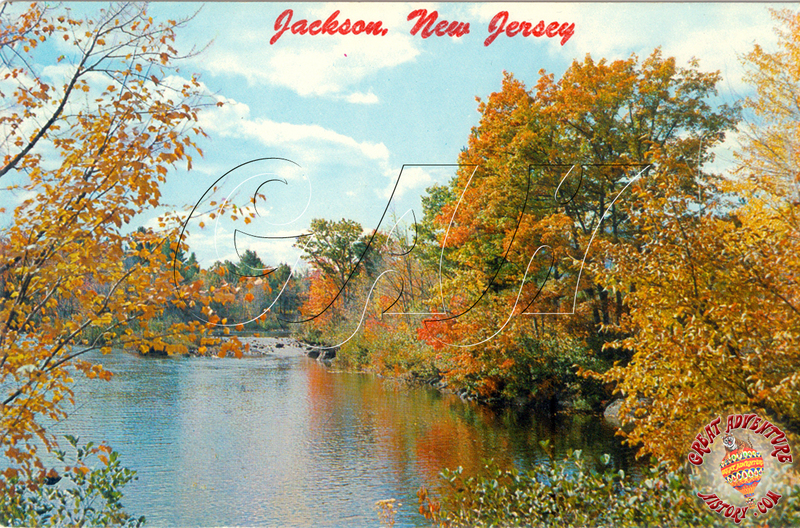 Just added to the collection... another early postcard of Jackson (pre-Great Adventure). Home651 f2d 852 switlik v. hardwicke company inc.
Neal S. Solomon (argued), Richard M. Altman, Pellettieri, Rabstein & Altman, Trenton, N. J., for appellants. Frederic K. Becker (argued), Wilentz, Goldman & Spritzer, Woodbridge, N. J., and Murray, Hollander & Sullivan, New York City, for appellees, Great Adventure, Inc., Hardwicke Companies Inc., and GSC/Six Flags Corp.; Daniel J. Sullivan, New York City, Christine D. Petruzzell, Woodbridge, N. J., Kathleen A. McMahon, New York City, on brief. Peter S. Hennes, Babcock & Hennes, Toms River, N. J., for appellee, Arthur F. Brown. Before ADAMS, ROSENN, and HUNTER, Circuit Judges. Stanley and Richard Switlik appeal from the dismissal of their civil rights action filed in the United States District Court for the District of New Jersey pursuant to 42 U.S.C. § 1983 (1976).1 The action sought to enjoin the enforcement of a New Jersey state court judgment against the appellants because execution of the judgment would allegedly punish constitutionally protected first amendment activity. The district court dismissed the case, holding that the Switliks' 1983 claim was barred by the doctrines of res judicata and collateral estoppel, the underlying first amendment issues having been raised and decided in the previous state court litigation. We affirm. 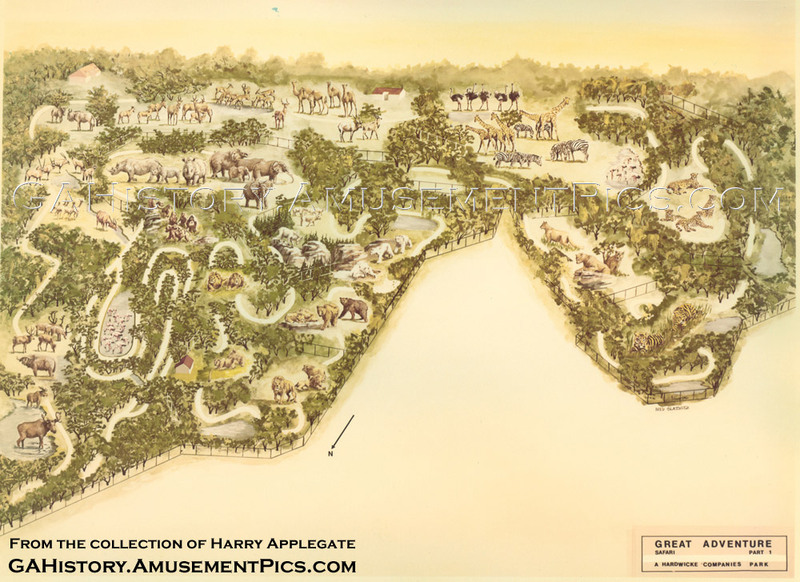 In May 1972 Stanley and Wanda Switlik contracted to sell to Hardwicke Companies, Inc.,2 a large tract of land on which was to be built a wild animal theme park and "related facilities." When it became clear that the "related facilities" were likely to overwhelm the "wildlife preserve" nature of the park, Stanley Switlik became concerned. At this point, Richard Switlik, Stanley and Wanda's son, became involved in the land sale transaction. Richard began insisting on various additions and alterations to the transaction before the deal was to close. 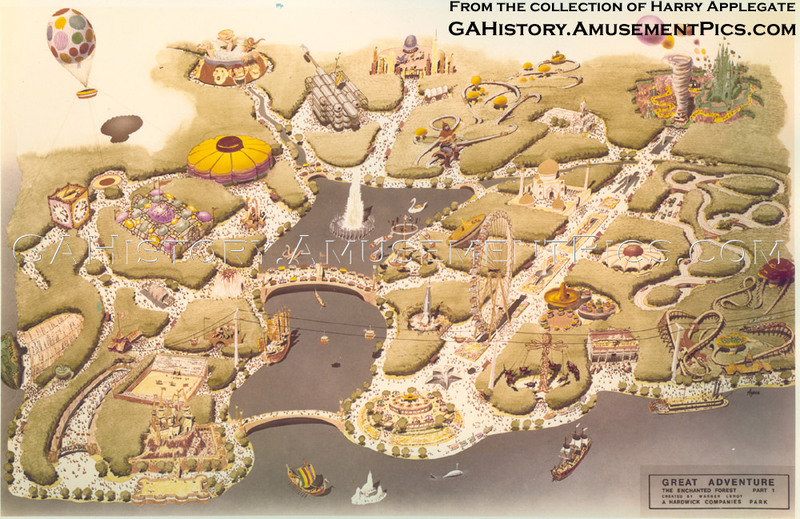 Great Adventure finally sued for specific performance of the contract but, due to the projected delay and expense of the litigation, settled the suit on unfavorable terms in order to close the deal on June 22, 1973. On the same day the sale to Great Adventure closed, Richard Switlik purchased a tract of land adjoining the land conveyed by his parents. He placed the land in trust for his four children (the Seelig trust). In September 1973, it was discovered that the access roads to the trust property had been chained off by Great Adventure. The trust brought suit to protect access and settlement was reached when Great Adventure bought the trust property. During the course of the Stanley Switlik and Great Adventure negotiations, it was assumed that a wedge-shaped parcel of property, designated as "10-C," which jutted into the property subject to transfer was owned by the State of New Jersey by virtue of a deed of gift from Stanley Switlik in 1964. The negotiations proceeded under assurances from Stanley that the state would be willing to trade parcel 10-C for another portion of the property being transferred. However, in July 1973, after the transfer from Stanley to Great Adventure was completed, Richard Switlik, by an unusual move, obtained an amendment to the deed, thereby returning title to parcel 10-C to Stanley Switlik. 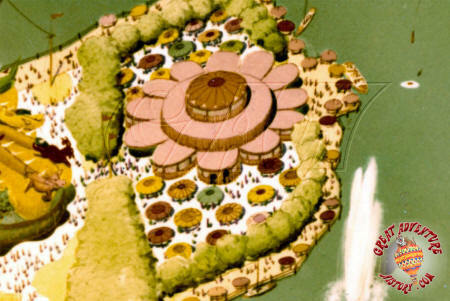 This posed an insurmountable obstacle to Great Adventure's plans and construction of the major portion of the park had to be delayed pending resolution of the parcel 10-C problem. In September 1973 Stanley Switlik filed suit in the Superior Court of New Jersey, Chancery Division, to enjoin Great Adventure's cutting of trees on Stanley's property and for damages for trees already removed. A preliminary injunction was denied, but this decision was reversed on appeal. Great Adventure answered and asserted six counterclaims, naming Richard Switlik as an additional defendant. The claims relating to the alleged trespass were severed and tried. The trial court reached the following conclusions: (1) the parties had never reached agreement on the boundaries of the parcel that had been conveyed; (2) the Switliks had "deliberately misled" the buyers concerning the ownership of parcel 10C; and (3) the Switiks were not entitled to the use of the existing public access road, which bisected the park, as a means of egress and ingress to their property. The trial court set boundaries in accordance with what it perceived to be the parties' intent and imposed a constructive trust on parcel 10-C for the benefit of Great Adventure. The remaining issues raised by Great Adventure's counterclaims were resolved in separate trials on liability and damages. The findings were that Stanley and Richard had committed fraud with respect to parcel 10-C, that Richard had unlawfully interfered with the relationship created by the contract of sale between his parents and Great Adventure, and that Richard had unlawfully interfered with the prospective economic advantage of Great Adventure. Damages were assessed at $4,912,043 for the fraud count; $1,318,571 for the interference with contract claim; and $117,053 for the interference with prospective economic advantage. The judgment was appealed to the Appellate Division of the New Jersey Superior Court and it affirmed per curiam. The New Jersey Supreme Court denied review and reconsideration. The United States Supreme Court denied a petition for a writ of certiorari. The federal action was filed ten days later. The Switliks claim in the federal court that the state courts penalized Richard's constitutionally protected activities. The state trial court allowed Great Adventure to introduce into evidence certain letters written by Richard to various governmental agencies complaining about alleged violations of the law being committed by Great Adventure. The bulk of these complaints were of an environmental nature, usually making reference to the harm being done to the adjoining Switlik lands or lakes. Testimony was also elicited from Richard, on cross-examination, of his involvement in efforts to have the access road bisecting the park declared to be the public means of access to the Switlik property by the Jackson Township Planning Board. Further, evidence was received that Richard contributed $6,000 to the Upper Freehold Environmental Commission to defray the cost of an environmental suit brought by that group against Great Adventure. Although it appears that the Switliks' attorney interposed objections, or at least questioned the relevance of such evidence when it was offered, the trial judge admitted it, although he, too, at times had reservations concerning its relevance. Great Adventure's response to the objections and questions was that it demonstrated the malicious intent of Richard Switlik to ruin the Great Adventure project. (Richard Switlik) made numerous complaints by letter and otherwise to official and unofficial bodies concerning Hardwicke's activities both before and after the title to the property was conveyed. He persisted in claiming that his father had access through the original access road even after the settlement of this claim. He purchased the "Seelig Property" for at least the partial purpose of being in a position, as a neighbor, to make complaints through an alleged trustee. The complaints reinforced his own complaints against Hardwicke. He did not disclose his interest in this property. He participated in the financing of a law suit by the Environmental Commission of Upper Freehold, et al, by furnishing at least some of his money to the plaintiffs for legal expenses. He caused twenty (20) tons of sand to be dumped in a drainage area to the disadvantage of Hardwicke. He appeared before the Planning Board and spoke out in opposition to the location of an Entertainment Park on the Hardwicke property although he had participated in the settlement leading to the title closing. He knew that this settlement specifically contemplated such a park. The above activities interfered with and were detrimental to Hardwicke's economic position. In awarding damages to Great Adventure, the state court expressly allowed recovery of the company's legal fees in defending against the Seelig trust suit and the Environmental Commission suit. In their federal action, plaintiffs complained that the state trial court had predicated its findings of malice, an essential element in all of defendants' state causes of action, at least in part on evidence of Richard Switlik's complaints to governmental authorities about recurring violations of the law by Great Adventure. These activities, plaintiffs allege, are protected under the first amendment's Petition Clause and their exercise may not serve as the basis of liability under state tort law. The district court found that the constitutional issues had been raised and litigated in the state court. Therefore, the court concluded that the plaintiffs' civil rights claim was barred by principles of res judicata and collateral estoppel.3 We review the correctness of that judgment. Our analysis begins with an issue largely ignored by the parties to this appeal: the nature of the judgment presented to us for review. The judgment was entered in response to the defendants' Motion to Dismiss Plaintiffs' Complaint. However, the defendants had submitted two affidavits in support of their motion. One, executed by Carl Hollander, related facts relevant to the issue of the court's personal jurisdiction over one of the defendants. The other affidavit, executed by Frederic K. Becker, attorney for the defendants, detailed the history, in and out of court, of the dispute between these parties. This affidavit was offered in support of the defendants' assertion in their motion that the claims represented by the federal civil rights action were barred by the doctrines of res judicata and collateral estoppel. If, on a motion ... to dismiss for failure of the pleading to state a claim upon which relief can be granted, matters outside the pleading are presented to and not excluded by the court, the motion shall be treated as one for summary judgment and disposed of as provided in Rule 56, and all parties shall be given reasonable opportunity to present all material made pertinent to such a motion by Rule 56. The district court did not exclude Becker's affidavit in ruling on the defendants' motion to dismiss. While the motion was pending, the court issued an oral opinion on the plaintiffs' request for a preliminary injunction against execution on the state judgment. Switlik v. Hardwicke Co., Civ. 80-1344 (D.N.J. June 4, 1980) (transcript of oral opinion denying request for preliminary injunction). The district court denied the request because the "plaintiffs (had) not demonstrated a likelihood of success on the merits." Id. at 18. The court concluded that plaintiffs could not prevail because their constitutional claims were "barred by the doctrines of res judicata and collateral estoppel." Id. The court's conclusion that the claims were barred was based on its examination of "the portion of the record of the State Court proceedings filed in this action...." Id. at 21. It is apparent that this included the Becker affidavit. That document, as noted earlier, narrated the history of the dispute that gave rise to the claims then before the district court for resolution. The affidavit contained an unequivocal assertion that "(t)he so-called First Amendment issue was raised by Richard Switlik at every level of the State Court...." Becker Affidavit at P 28. In support of that assertion, excerpts from briefs submitted by the Switliks to the Appellate Division of the New Jersey Superior Court, the New Jersey Supreme Court, and the Supreme Court of the United States were attached to the affidavit. Those attachments demonstrate that the very issues presented by this civil rights action were raised and litigated in at least the appellate courts of New Jersey and were presented to the United States Supreme Court in the petition seeking a writ of certiorari. The district court, in denying the application for injunction, referred to and quoted from these appellate brief excerpts, which appear in the record only as attachments to the Becker affidavit. Switlik v. Hardwicke Co., Civ. 80-1344, slip op. at 13, 14-16 (D.N.J. June 4, 1980). The rationale employed in denying the injunction was later expressly relied on by the district court in ruling on the defendants' motion to dismiss. Transcript of Proceedings, Hearing on Defendants' Motion to Dismiss, at 16, Switlik v. Hardwicke Co., Civ. 80-1344 (D.N.J. June 16, 1980). On reading this record on appeal, one can only conclude that the district court converted the Rule 12( (6) motion into one for summary judgment and granted it. One final issue must be resolved before undertaking a substantive review of the district court's grant of summary judgment for the defendants. Rule 12( requires that, if materials outside the pleadings are offered and considered in connection with a converted Rule 12( (6) motion, "all parties shall be given reasonable opportunity to present all material made pertinent to such a motion by Rule 56." Although it does not affirmatively appear from the record that the trial judge notified the parties of his intent to treat the motion before him as one for summary judgment, we are satisfied that all parties were given ample time to submit pertinent materials supporting their respective positions. The order dismissing the complaint states that counsel for all parties had indicated that they had no further documents to file. The Notice of Motion indicating the defendants' intent to rely on matters not contained in the complaint was given May 28, 1980, and the court denied the preliminary injunction on June 4. When the court denied the injunction, it became evident to counsel that if nothing else was presented to support the complaint before the argument on the dismissal motion scheduled for twelve days later, the action would be dismissed for the reasons announced in the bench opinion denying the injunction. Moreover, the Switliks have not claimed in this court prejudice resulting from the conversion of the motion to dismiss into one for summary judgment. Indeed, as alluded to above, neither party has mentioned this procedural aspect of the case, although it significantly affects the burden the plaintiffs must bear on appeal. Absent such an allegation of prejudice and absent plain error, we must regard the district court's action as an entry of summary judgment. See Sprague v. Fitzpatrick, 546 F.2d 560, 563 (3d Cir. 1976), cert. denied, 431 U.S. 937, 97 S.Ct. 2649, 53 L.Ed.2d 255 (1977). See also Carter v. Stanton, 405 U.S. 669, 671, 92 S.Ct. 1232, 1234, 31 L.Ed.2d 563 (1972). Therefore, we will restrict our review to determining whether the record before us discloses any genuine issues of material fact and, if not, whether the district court committed any errors of law. The only remaining issue is whether the district judge properly formulated and applied the law to the facts before him. The Switliks concede that the doctrines of res judicata and collateral estoppel have a place in section 1983 litigation. However, relying on New Jersey Education Association v. Burke, 579 F.2d 764 (3d Cir. ), cert. denied, 439 U.S. 894, 99 S.Ct. 252, 58 L.Ed.2d 239 (1978), as the controlling law of this circuit, they argue that the doctrines should preclude only those claims that were "fully and unreservedly" litigated in the state courts. Citing to the Supreme Court's language in Stone v. Powell, 428 U.S. 465, 96 S.Ct. 3037, 49 L.Ed.2d 1067 (1976), they argue that it must appear that the federal plaintiffs had a "full and fair opportunity" to litigate their claims in the state courts. The Supreme Court has shown a certain willingness to adopt a similar view. In Allen v. McCurry, 449 U.S. 90, 101 S.Ct. 411, 66 L.Ed.2d 308 (1980), the Court held that the res judicata doctrine will indeed operate to bar section 1983 plaintiffs who have previously pressed their claims in state courts. The Court, however, seemed predisposed to accept a limited role for the doctrine in a section 1983 action, as it noted that in applying res judicata in other contexts involving federal and state conflicts it "has repeatedly recognized ... that the doctrine of collateral estoppel cannot apply when the party against whom the earlier decision is asserted did not have a 'full and fair opportunity' to litigate (the) issue in the earlier case." Id. 449 U.S. at 95, 101 S.Ct. at 415. To the extent the Switliks argue that Burke demands "federal fact-finding" in this case, see 579 F.2d at 773, the argument must fail. In the cited portion of Burke, this court was referring to observations made by the Supreme Court in England v. Louisiana State Board of Medical Examiners, 375 U.S. 411, 84 S.Ct. 461, 11 L.Ed.2d 440 (1969). Those observations must be examined in light of the fact patterns of Burke and England. Both cases involved federal plaintiffs who, after initiating their federal action, were remitted to state courts by operation of federal abstention doctrines. Younger v. Harris, 401 U.S. 37, 91 S.Ct. 746, 27 L.Ed.2d 669 (1971) (Burke); Railroad Commission of Texas v. Pullman Co., 312 U.S. 496, 61 S.Ct. 643, 85 L.Ed. 971 (1941) (England and Burke). Upon completion of the state proceedings, the Burke and England plaintiffs returned to federal court and were faced with res judicata defenses premised on the state litigations. The England Court's statements concerning the importance of federal fact-finding came in connection with its holding that "in cases where, but for the application of the abstention doctrine, the primary fact determination would have been by the district court, a litigant may not be unwillingly deprived of that determination." 375 U.S. at 416, 84 S.Ct. at 465 (emphasis added). Thus, it is the invocation of the abstention doctrines, and the accompanying loss of a federal forum by a plaintiff who has deliberately chosen it initially, that triggers the overriding concern for federal fact-finding. Further, even if there is merit to the Switliks' complaint that the state trial court's treatment of their constitutional claim was inadequate, the claim was freely and forcefully pressed on the state appellate courts. The affirmation of the trial court's judgment by other than a signed opinion is of no consequence. Had the Appellate Division seen the need for further fact-finding, it would have remanded for additional proceedings. It is important to note that Allen v. McCurry, supra, referred to a "full and fair opportunity to litigate" in the state court. 449 U.S. at 95, 101 S.Ct. at 415 (emphasis added). Indeed, the Switliks claim that they were denied such an "opportunity." They claim that the trial court repeatedly stated its intention to receive evidence and hear argument on the constitutional claim but failed so to do. However, even in the quoted passages of the state proceedings found in their brief, plaintiffs are consistently unable to point to a statement of the trial judge that, taken in context, bears this out. More damaging is the unanswered assertion of the defendants that, having raised the issue in the course of the trial, the Switliks did not request a hearing on the matter before submitting the case for decision. The conclusion that must be reached, on the basis of the evidence in this record, is that the Switliks asserted their constitutional claim at the state trial level when the questionable evidence was presented. Although the record before us does not indicate how receptive the trial court may have been to their arguments, the record is clear that the plaintiffs vigorously pressed their constitutional claims in the state appellate courts. They now seek to have the same issues heard again in the federal system. This is the precise situation in which the doctrines of res judicata and collateral estoppel operate as a bar, for they not only "reduce unnecessary litigation and foster reliance on adjudication, but also promote comity between state and federal courts that has been recognized as a bulwark of the federal system." Allen v. McCurry, 449 U.S. at 95-96, 101 S.Ct. at 415. Having concluded that the district court entered an order granting summary judgment, that there existed no genuine issue of material fact, and that the record demonstrates that the plaintiffs had a full and fair opportunity to litigate their constitutional claims in state court, we hold that the district court correctly concluded that the claims presented by this section 1983 action are barred by res judicata and collateral estoppel. We in no way express a view on the merits of the state court's action or on the size of the damages that were assessed against the Switliks. The judgment of the district court will be affirmed. Each side to bear its own costs. I concur in the result reached by the majority's careful opinion. I write separately because appellants have failed to allege the existence of state action sufficient to establish a federal claim, hence I do not reach the res judicata issue. It is axiomatic that to state a cause of action under section 1983 a complaint must allege both that the defendant was deprived of a right secured by the Constitution or laws of the United States and that the deprivation of this right was "under color of any statute, ordinance, regulation, custom or usage of any state or territory. "1 Adickes v. S. H. Kress & Co., 398 U.S. 144, 150, 90 S.Ct. 1598, 1604, 26 L.Ed.2d 142 (1970); Benner v. Oswald, 592 F.2d 174, 178 (3d Cir. ), cert. denied, 444 U.S. 832, 100 S.Ct. 62, 62 L.Ed.2d 41 (1979). While the state court's enforcement of an agreement between two private individuals can, in certain instances, constitute state action, Shelley v. Kraemer, 334 U.S. 1, 68 S.Ct. 836, 92 L.Ed. 1161 (1948); Benner, 592 F.2d at 178, the New Jersey court's judgment of fraud and commercial interference between two private parties is not an action under color of state law. As the fifth circuit said in Hill v. McCellan, 490 F.2d 859, 860 (5th Cir. 1974) overruled on other grounds, Sparks v. Duval County Ranch Co., 604 F.2d 976 (5th Cir. 1979) (en banc), aff'd sub nom. Dennis v. Sparks, 449 U.S. 24, 101 S.Ct. 183, 66 L.Ed.2d 185 (1980): "There is no cause of action under the Civil Rights Act if a case is private litigation in which the state does no more than furnish the forum and has no interest in the outcome." Id. Accord, Dahl v. Akin, 630 F.2d 277, 280-81 (5th Cir. ), cert. denied, --- U.S. ----, 101 S.Ct. 1977, 68 L.Ed.2d 296 (1981). Quite simply, there is no state action in this case, hence there is no federal claim that can be subject to the doctrine of res judicata. By deciding this case on res judicata grounds, the majority places its imprimatur on a theory of state action that in my view represents an unwarranted expansion of Shelley v. Kraemer's enforcement doctrine. The enforcement of a state court judgment that resolves the contractual claims of two private individuals does not constitute state action for section 1983 purposes. Cf. Dennis v. Sparks, 449 U.S. 28, 101 S.Ct. 183, 186, 66 L.Ed.2d 185 (1980) ("Merely resorting to the courts and being on the winning side of a lawsuit does not make a party a co-conspirator or joint actor with the judge"). As I stated in Parks v. Mr. Ford, 556 F.2d 132, 162 (3d Cir. 1977), such a theory "would, if expanded to its logical conclusion, completely emasculate the concept of state action" because "(e)very activity permitted under state common law, any activity that has legal consequences, can be transformed into a right enforced by state courts if the parties so chose." Id. The federal courts do not sit as an appellate review for all state court adjudications of constitutional rights. Atlantic Coast Railroad Co. v. Brotherhood of Locomotive Engn'rs, 398 U.S. 281, 296, 90 S.Ct. 1739, 1748, 26 L.Ed.2d 234 (1970); Lampkin-Asam v. Supreme Court of Florida, 601 F.2d 760 (5th Cir. ), cert. denied, 444 U.S. 1013, 100 S.Ct. 662, 62 L.Ed.2d 642, rehearing denied, 444 U.S. 1103, 100 S.Ct. 1071, 62 L.Ed.2d 790 (1979). Indeed as the Supreme Court reasoned in Stone v. Powell, 428 U.S. 465, 493-94 n.35, 96 S.Ct. 3037, 3052 n.35, 49 L.Ed.2d 1067 (1975): "State courts, like federal courts, have a constitutional obligation to safeguard personal liberties and uphold federal law." In this case the Switliks pursued the full procedural protections of the state court followed by a denial of certiorari by the United States Supreme Court. They should not be allowed to initiate a new attack on an adverse state court ruling by claiming that enforcement of the judgment constitutes state action. (3) To redress the deprivation, under color of any State law, statute, ordinance, regulation, custom or usage, of any right, privilege or immunity secured by the Constitution of the United States or by any Act of Congress providing for equal rights of citizens or of all persons within the jurisdiction of the United States. State action is likewise essential if the appellants were to proceed under general federal question jurisdiction, 28 U.S.C. § 1331(a) (1976). The under color of state law requirement of section 1983 has consistently been treated as the same thing as the "state action" required under the fourteenth amendment. United States v. Price, 383 U.S. 787, 794 n.7, 86 S.Ct. 1152, 1157 n.7, 16 L.Ed.2d 267 (1965). Cf. Dennis v. Sparks, 449 U.S. 28, 101 S.Ct. 183, 187 n.5, 66 L.Ed.2d 185 (1980) (the state action requirement of 18 U.S.C. § 242 (1976) has been interpreted coextensively with the state action requirement of § 1983). Hence, under either avenue, state action is a necessary element of federal jurisdiction. I thought I would post this here - home of the very first Spotlight we did on Great Adventure way back in 2007 on the park's Original Proposal. Today I have reached 10,000 posts. That is a lot of talking about Great Adventure and to be honest it all came quite easily being it is a topic I admire so much. Hopefully I didn't bore you guys too much with my babble over the years! Here's to the next hundreds of discussions and thousands of posts. I couldn't have done it without all you guys - folks that I consider the best forums group anywhere! Thanks!